I am lucky enough to have a friend who works at Sephora who regularly supplies me with awesome samples. At this time of year, I really like trying moisturizers. Okay, and treatments. However, this review is for a moisturizer. Specifically, it is for the deliciously scented, AmorePacific FUTURE RESPONSE Age Defense Creme. I want to add, I felt like a freaking celebrity using this because this gem retails for….drumroll…$195 USD!!! Sorry for the cutoff picture, but I totally spaced on getting a pic before I tore it open. Wah. According to the company, it will protect your skin from pesky environmental invaders. I thought it smelled so pretty! Very perfumy, so if this is not your thing, stay away from this product. I love scents, so this was perfect for me. Also, the scent fades very quickly. Because it is so heavily scented, I was surprised how moisturizing it was. It made my skin feel really good. Another important point, AmorePacific FUTURE RESPONSE Age Defense Creme is super light weight. It melts into your skin. Yes, if this were in my budget. At this time it is not, but as soon as I have more play money…OH IT IS ON, AmorePacific FUTURE RESPONSE Age Defense Creme! 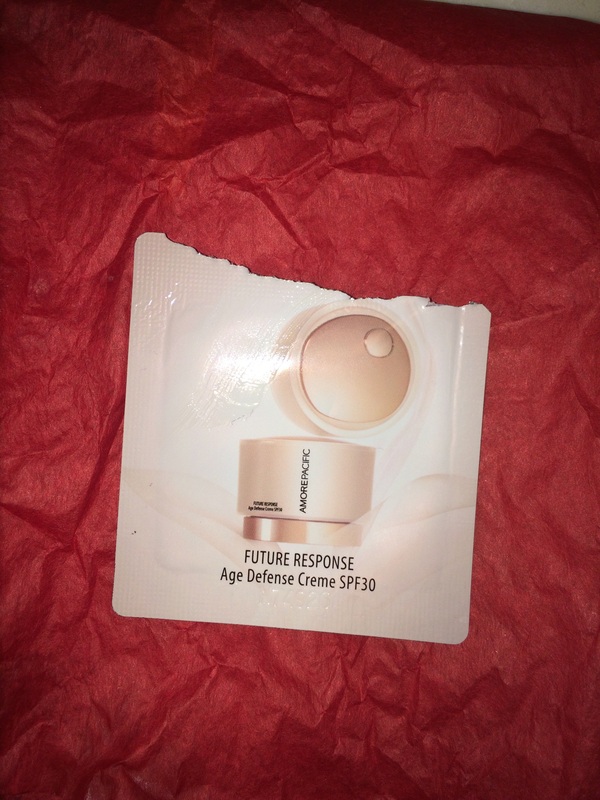 Have you tried AmorePacific FUTURE RESPONSE Age Defense Creme? Or another high end moisturizer? Do you like it? Are they worth the hype? Tell us!